Recently I have been in touch with a company called Maggie Anne. You may have heard of them, you may not have. 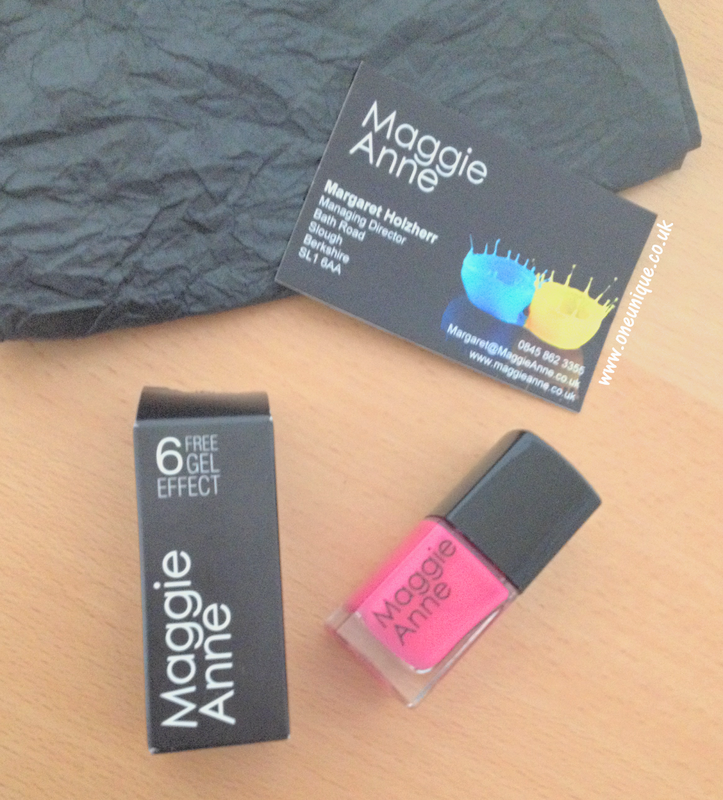 The lovely people at Maggie Anne very kindly sent me one of their beautiful nail polishes to try out and review for you all. 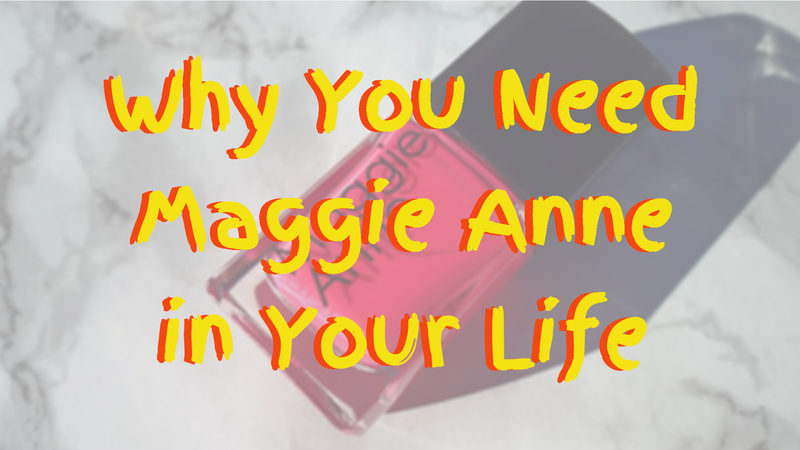 Maggie Anne have a collection of nail polishes, which are 6 toxin free, are equivalent to a shellac with their glossy gel finish. The performance of these products is amazing. Not only do they give an excellent finish they are also free of the 3 main chemicals found in your average nail polish (Toluene, Dibutyl Phthalate (DBP) and Formaldehyde) as well as 3 other chemicals which are classed as 'dangerous' (Formaldehyde Resin, Camphor and THTP). 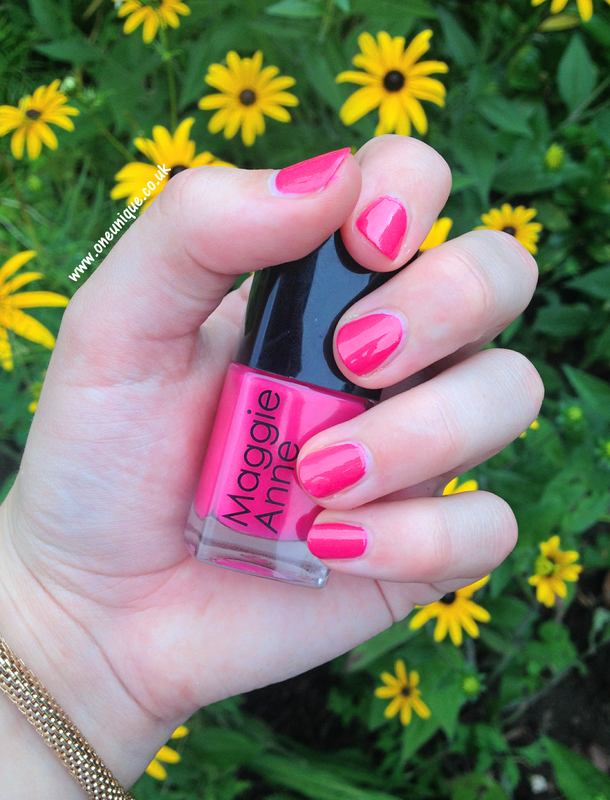 Additionally, Maggie Anne's products are not tested on animals - so it's vegan friendly! The surprises just keep on coming! These nail polishes are so safe to use. Pregnant women, anyone under treatment for an illness and those with allergies are all able to use Maggie Anne Nail polishes due to their 6 toxin free regulation. They always provide you with a flawless finish due to their easy application brush. Furthermore, your lovely nails will last 5-7 days with two coats. I had told the company to surprise me on the colour, I pretty much will use any colour you give me. It came in a cute little package, all wrapped up in black tissue paper. When I unwrapped it, the excitement was overwhelming - I was then faced with the box. I had one more thing standing in my way until I could find out what colour I had been sent. First, the box. It's pretty classy if you ask me. Admittedly, I did have to break the lid flap thing (I don't know what you call it, lol) to try and get into it but I think I was just being weak. The colour I was faced with was gorgeous. When I first set my eyes on it, I was slightly terrified about how bright it was but then I actually started to warm to it. I just had to try it. Look at that shine! The name of this colour is Aisling. My nails, here, have 3 coats on them, it literally took me 5 minutes to paint them too. This is definitely a go to colour for summer, it's a beauty of a colour. Some colours like these are difficult to pull off if you have really short nails, but this is an exception. I tried Aisling on Friday night and they lasted until Tuesday morning in the shower. For me, this is an excellent time scale as my nails are quite weak. I used to find it really difficult to get a nail polish to last over a day, I know where I'll be buying from more often. 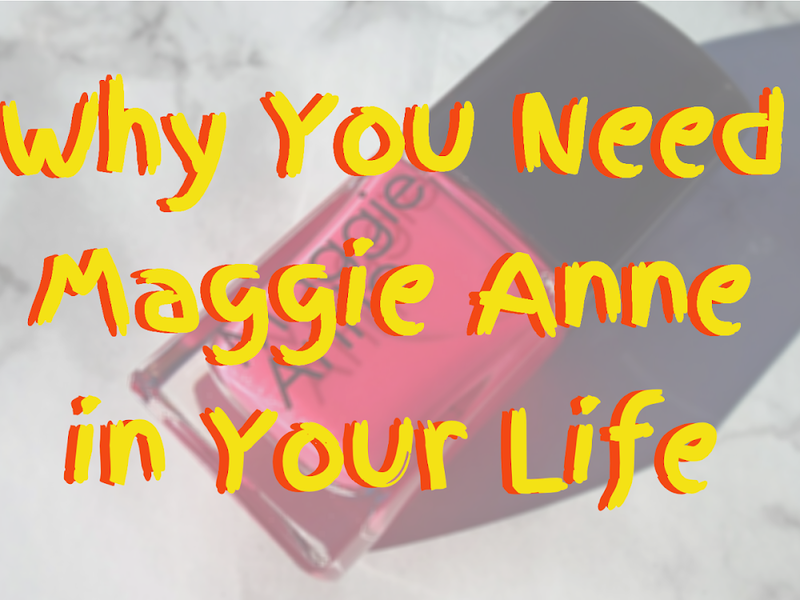 If you would like to purchase a Maggie Anne nail polish it would cost you £10.50 BUT Maggie Anne have been very generous and allowed myself and you lot a 20% discount if you use the promotional code 'BLOGGER'. Also, Maggie Anne have been nominated for the Pure Beauty Awards. Find about more on how you can vote here. A massive thanks to Margaret from Maggie Anne. This product was sent, courtesy of Maggie Anne, for reviewing purposes.